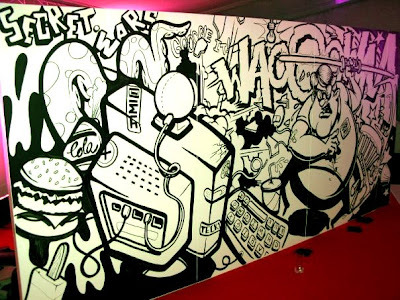 Secret Wars were asked to paint at the Zeitgeist Europe 2008 Gala Dinner @ The Grove, Watford. 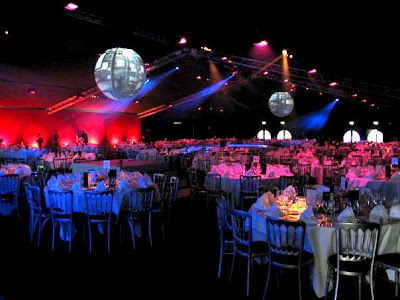 The show included the most popular acts on Youtube including Beardyman, Mia Rose and the Vagabonds breakdance crew to name a few. Jimi Crayon, Stika, Mr k and the Disco Teck warmed things up with a display of live illustration. Due to security at the party (with Gordon Brown and the Queen of Jordan in attendance) we were not allowed to enjoy the open bar and other live acts, so the crew headed to the hotel bar for an evening of overpriced drinks and unacceptable behavior. Click here for more videos of the whole event.